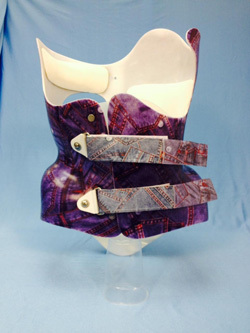 The Cheneau brace is a thermoplastic scoliosis brace modeled on a hyper-corrected positive plaster cast of the patient. This is a three-dimensional correctional brace that has significant pressure and expansion areas built into it, providing correction in all three anatomical planes. The Schroth Method for scoliosis is a conservative exercise in a three-dimensional approach to elongate the trunk and correct imbalances of the spine. The goal is to develop the inner muscles of the rib cage in order to change the shape of the upper trunk and correct any spinal abnormalities. The patient utilizes specific exercises to straighten, centralize and de-rotate the spine with corrective breathing techniques. Exercises are designed based on the curve patterns and severity, as well as the patient's function and mobility. The goal is to create awareness of the new posture and alignment through position, repetitions and breathing. Exercises are designed to reduce the flat back and rib prominence and restore alignment of the pelvis. Exercise positions may be modified in order to create the optimal position for the patient. The brace takes 15 different curvature patterns into consideration, which de-rotates the body much better through the longitudinal axis, unlike other braces. The main benefit of the brace is the unique and highly effective biomechanical design tailored specifically to the patient. Successful treatment with the brace is based on targeted and consistent implementation. Conclusion: The Chêneau brace can be useful for preventing curvature progression in patients with AIS. However, the results of this study reveal high variability in the effect of brace treatment on sagittal and pelvic alignment. 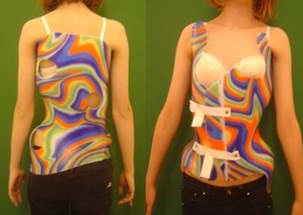 Treatment with the Chêneau brace may also influence sagittal global balance. Conclusion: Conservative treatment with Chêneau orthosis and physiotherapy was effective in halting scoliosis progression in 48.1% of patients. The results of this study suggest that bracing is effective in reducing the incidence of surgery in comparison with natural history. Stud Health Technol Inform. 2010;158:157-166. Conclusion: Correction of spinal deformities is achieved in conservative treatment with passive and active brace mechanisms. The mode of operation of modern braces is in accordance with various principles of correction, namely active or passive extension with the aid of a neck ring and correction by lateral pads, lateral pressure according to 3-point principle, compression, bending the trunk towards the opposite side, active bracing and correction by means of pressure exerted by bands during movement and by means of metallic blades. The Schroth family has authored a number of books and articles to educate others about their method. Today, the Schroth Method is recognized as an alternative to surgery or other treatments all over the world. The Centers for Medicare and Medicaid Services (CMS) released proposed new rules for the Medicare and CHIP Reauthorization Act (MACRA). As promised, the new rules feature some game-changers for health care providers around the CMS Quality Payment Program, specifically through the Merit-Based Incentive Payment System (MIPS) and alternative payment models (APMs). At the same time, CMS will get much more specific about requirements for approved APMs, and create a roadmap that will guide providers on forming or participating in models such as accountable care organizations and patient-centered medical homes. Pennsylvania Physical Therapy Association (PPTA) Annual Conference, Oct. 28-30, Lancaster Marriott at Penn Square, Lancaster, PA. Please feel free to submit your questions on the Cheneau® Brace and the Schroth Method for Scoliosis as well as any other issue you would like addressed. Unsubscribe instantly from these emails by clicking here | Forward this email to a friend | Received this from a friend? Subscribe | Email look weird? View it on the web here.